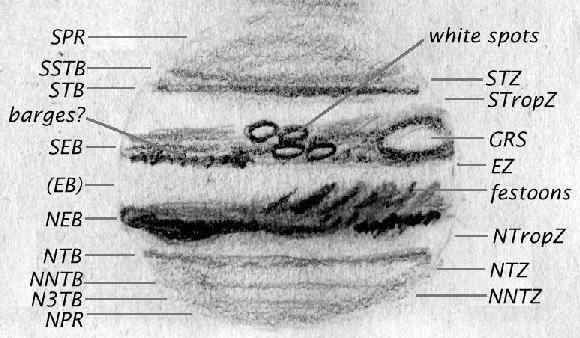 This chart of Jupiter was done by Jane Houston Jones. Ever looked at clouds and dreamed about the shapes they made? How about clouds the size of planets? The cloud covered planet Jupiter is at its best in May. Just past opposition (last month), it's already high at sundown, and transits before midnight. That means it's time for our annual review of Jupiter's cloud features! The sketch accompanying this article shows some of the features you can expect to see with an amateur sized telescope. Start with the Equatorial Bands, north and south. They look different - one is darker than the other, and better defined - but when you're just getting started, the easiest way to tell them apart is by bumping your scope a little in the direction of north or south, to tell which direction is which. Once you see the bands, you'll probably notice the polar regions, rather grey or grey-blue compared to the mostly creamy yellows and pale reds of the rest of Jupiter's disk. The equatorial bands and polar regions should be visible in any telescope, down to the smallest 60mm department store refractor or Astroscan portable. If you don't see them right away, though, don't despair: keep looking! Seeing detail on planets takes practice: the more you look, the more you'll see. Guaranteed. Of course, it never hurts to try different eyepieces: more power, or less, may help. Star parties are great for that: you may be able to borrow eyepieces and see what powers work best in your own scope, or at least look at the effect of different magnifications in other people's scopes, to find out if you need to add to your eyepiece collection. After getting a good look at the bands, you'll undoubtedly want to see Jupiter's famous "Great Red Spot", a giant anti-cyclone (it's a high pressure storm, not a low pressure one like a cyclone) in Jupiter's southern hemisphere. Last year, there was some hope that the Great Spot Formerly Known As Red was getting pinker, and that over time we might actually have a Red Spot to look at, something that stands out and that we can show passers-by at star parties. No such luck. So far this year, the GSFKAR is just as pale pink as in other recent years. You'll recognize it better by looking for the "Great Red Spot Hollow", the place where the southern equatorial band splits to go around the spot, then rejoins on the other side. The band is darker than the spot itself, but if you look for an area where it's a little wider, with a split in the middle, you'll probably hit the right area. On a really good night, with good optics, you can see detail inside the spot itself. Don't expect to see this every time, but it's something to hope for when the air steadies out. On a night like that, you can also look for detail at the edges of the bands - long sweeping tendrils called "festoons" which sometimes appear blue, many fainter pale-pink bands in the temperate zones below the polar regions, the thin and elusive equatorial band, and the dark spots, or "barges", and the collections of white ovals, which appear at various places in Jupiter's atmosphere. Don't forget, as you look at this wealth of detail: the Red Spot is three times the size of the earth. Those little white ovals are nearly the size of the earth. And all these features are just cloud pictures, in the atmosphere of a planet so big it's hard to compare it to our own. Saturn is low in the western sky in the early evening: catch it now before it vanishes for the summer. This low in the sky, you won't see many cloud pictures, but the rings are always a treat. Most of the other planets are at their best in the morning sky. Pluto rises after 10, and doesn't transit until well after midnight, still low in the sky. Determined Plutocrats will be able to catch a glimpse, but most observers will want to wait a few months. Mars, Uranus, and Neptune share the morning skies; as with Pluto, you probably won't get a good look until later in the year. Mercury and Venus are both washed out in the sun's glare, and are not easily observable this month. On May 8th, the asteroid 1 Ceres (1 meaning it was the first asteroid ever discovered, in 1801 by Giuseppe Piazzi) is at opposition, at about 7th magnitude. It's a bit over a degree northwest of Zuben El Chamali, the northernmost bright star in Libra. A few days later, on the morning of the 14th, Mars and Uranus make a close pass; they might make an interesting pair for the early riser with a wide-field telescope.